ST. LOUIS • A wagon escorted by Union soldiers pulled up to a fashionable home on Chestnut at Seventh streets. Ten women climbed on board for a clattering ride to the steamboat landing. Rebel sympathizers sometimes ended up in a medical college renamed the Gratiot Street Prison or in Bernard Lynch’s former slave pen. The house on Chestnut was a recent addition to the political penal system. It was the city home of Margaret McLure, whose politics became fearless after her son was killed in Confederate service in 1862. Union leaders suspected that Pine Lawn, her country estate on Natural Bridge Road (and inspiration for the suburb by that name), was a communication post for rebels. McLure was put on the Belle Memphis. With her was Eliza Frost, well-to-do wife of rebel Gen. Daniel Frost. Two years before, he had surrendered the pro-Southern Missouri militia in St. Louis to Union Capt. Nathaniel Lyon on the site of today’s St. Louis University. Moments later, 28 civilians and seven Union soldiers were killed in a riot on Olive Street. Frost headed south. The banished ones debarked at Memphis and were taken to the Confederate line at Holly Springs, Miss. They rode in Union ambulances stained by blood. After the war, McLure returned to St. Louis and became a founding leader of the United Daughters of the Confederacy. The Frosts also came home, but Eliza died in 1872. Frost remarried and had a daughter, Harriet, who donated $1 million to St. Louis University in 1960. That same year, a statue of Capt. Lyon was banished from what became the university’s “Frost Campus” east of Grand Boulevard. The statue is now in Lyon Park, near the Anheuser-Busch brewery. A Copperhead on the War. "It is owing, then, to a departure from correct principles that we have got this war upon us -- a war that might and ought to have been avoided. And it should have been avoided by throwing the heresy of coercion to the winds, and submitting for brute force the wise and humane policy of conciliation, on the basis of equal and exact justice -- 'to all their rights.' The latter course would have saved our free institutions, and no doubt saved the Union; the former, only powerful for evil, finds its main satisfaction in presenting us with daily spectacles of slaughtered countrymen, whose lives have been uselessly sacrificed. The Nov. 30, 1861, issue of Harper’s Weekly featured a poem destined to become one of the essential texts of the Civil War, Ethel Lynn Beers’s “The Picket-Guard.” Beers, a 34-year-old native of Goshen, N.Y., said later that she wrote her only famous work in a single morning, after a boardinghouse breakfast at which one of her fellow residents relayed a newspaper report of “all quiet along the Potomac, as usual.” Beers had answered by reading aloud the sub-headline, “except a poor picket shot.” Her versified elaboration on the dispatch, in which a lonely guard is killed by a sniper early one morning, posed moral questions about the culture of war-making that have proved far more durable than her sentimental literary style. 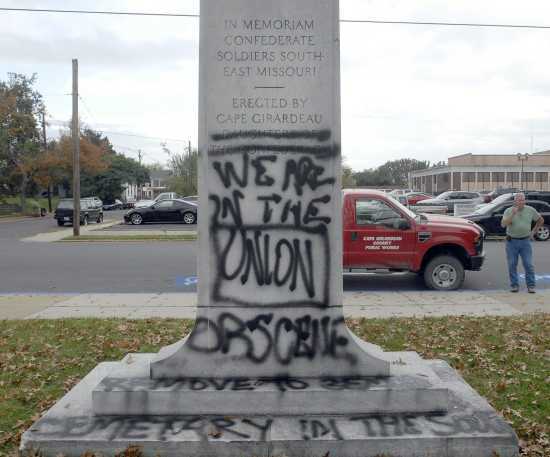 A Civil War monument on the grounds of the Common Pleas Courthouse in Cape Girardeau was struck by vandals who spray-painted both sides of the shrine with apparent pro-Union sentiments, nearly 150 years after the last shot was fired. But the message could still be read early Tuesday afternoon. "Go south" was written on the front of the shrine that sits along Lorimier Street near the fountain. That apparently was a request that the marker be moved, not a pro-South message. "We are in the union," read the words on the back. "Obscene. Remove to [illegible] cemetary (sic) in the south."